Many different locations for the setting of the Book of Mormon in the New World have been proposed.While none can be definitively confirmed, some are more probable than others. Archaeologist John Clark has outlined ten essential features that any proposed Nephite geographical location must have in order for it to be consistent with the text of the Book of Mormon. It should be noted that while Nephites do not refer to being located near an isthmus specifically, they do refer to a narrow neck of land that separates the north and south areas (see Alma 22:32). 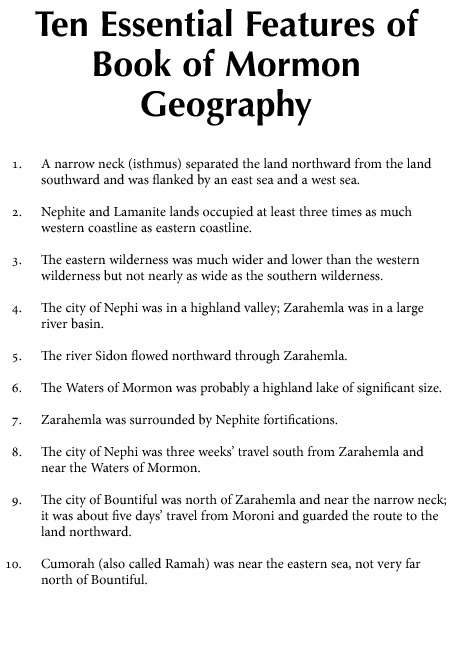 Persons interested in Book of Mormon geography who do not interpret this reference as an isthmus have more difficulty fitting their site to the Book of Mormon than do those who interpret the narrow neck passage as an isthmus. The features listed in this chart are based on the Book of Mormon text.